amk: Dissolvable Micro-Needles: Simultaneous Painless Injection Is Now Reality..! Dissolvable Micro-Needles: Simultaneous Painless Injection Is Now Reality..! Claims for practical, easy to use and painless application, the self-administer vaccines device consists of 100 microscopic needles, ready for simultaneous injection. The amazing part is the micro-needles, which could dissolve rapidly and leave no trace of injection on the patient’s skin surface. And yes, the self-administer vaccines needles are made in micro size of 650 microns in length and assembled into an array of 100 needles on a study over mouse. This self-administer vaccines is a project by Emory University to replace the conventional injection needles in the future. Once pressed into the skin, these microneedles quickly dissolve in bodily fluids, leaving only the water-soluble backing. The backing can be discarded because it no longer contains any sharps. These microneedles were made from polymer, poly-vinyl pyrrolidone material, that has tested safe for use in the body. 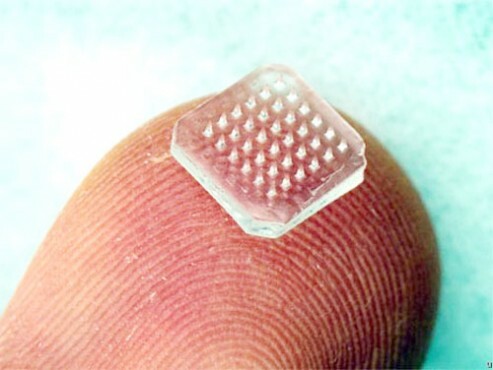 The vaccine is freeze-dried and mixed with a vinyl-pyrrolidone monomer before being placed into microneedle molds and polymerized at room temperature using ultraviolet light. This new micro vaccine system is capable of providing improved immunization against common diseases such as influenza, cough, headache, etc.